After 2011's 'w h o k i l l' brought her widespread acclaim, Merrill Garbus faced great expectations. For 'Nikki Nack,' her pop-friendly follow-up, the former puppeteer found refuge in disparate rhythms. 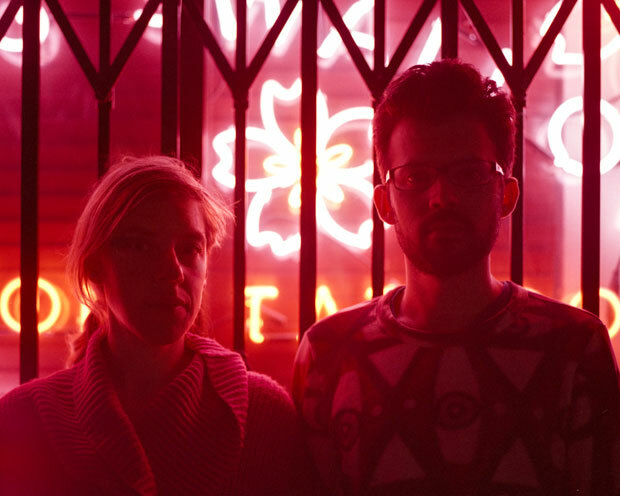 Merrill Garbus and Nate Brenner of tUnE-yArDs are eating dinner at a vegan Chinese restaurant in Oakland called Golden Lotus. The scene is busy and chaotic. A nearby baby is squawking at random intervals. There are loud conversations happening all around us, and the clatter of dishes and silverware. We order food ranging from Mongolian fake “beef” to a giant, steaming bowl of hot-and-sour soup studded with chunks of pineapple. Amid the chaos, Merrill Garbus of tUnE-yArDs looks calm and peaceful. The colors in the run-down restaurant are drab, but she and her bass player and partner-in-crime Nate Brenner are a riot of color. She’s wearing a cotton-candy pink sweater, with black leggings, red sneakers, yellow socks, and black and white checkered shoelaces. Brenner is sporting a black scruffy beard, and he’s wearing a slightly faded blue and black patterned top and black pants. Nikki Nack is the band’s most polished statement yet. The production values are higher than they were on their previous albums BiRd-BrAiNs and w h o k i l l, and the songs are uniformly tight. Melodically, rhythmically and lyrically, Nikki Nack has more of a coherent flow than their previous albums. But at its heart, the album still has a lovably scrappy, everything-but-the-kitchen-sink aesthetic that is distinctly their own. But Garbus thrives on chaos and unpredictability. She likes the live-ness of the tUnE-yArDs setup, and how “anything can fall apart at any moment,” she says. (“I don’t know if the audience realizes that!” she says, laughing.) The music feels handmade; you can see the seams — their live shows are like a one-of-a-kind creation each time. For the current tour, tUnE-yArDs expanded to a five-piece, with two backup singers and a new live drummer, adding even more energy to their already energetic sound. Garbus and Brenner spend a lot of time thinking about rhythm. For tUnE-yArDs, music comes from the rhythm up — they think about the groove first, before the melody and the lyrics. Garbus doesn’t really like drum machines, and prefers to loop drums with a looping pedal, or use live drummers. (She also drums herself, while she sings.) She likes for the groove to be slightly askew, rather than having everything be totally perfect. Onstage in San Francisco last month, their first gig in a year and a half, Garbus was a bona fide pop star. The audience was a diverse swirl — black, white, Asian, Hispanic, queer, old, young — reflecting the Bay Area in all its glory. She looked radiant and a bit otherworldly, in a green aqua bodysuit with puffy, glittery gold sleeves and glittery gold eye shadow. When the band first hit the stage, she seemed a bit nervous. But the minute the music started, something changed. Garbus commanded the room, belting her rich, earthy voice to the very back of the crowd. Women made out passionately with each other. Others yelped, and jumped up and down. People pumped their fists in the air at the choruses like it was Cheap Trick live at Budokan. tUnE-yArDs were on it. Garbus didn’t even need the mic.